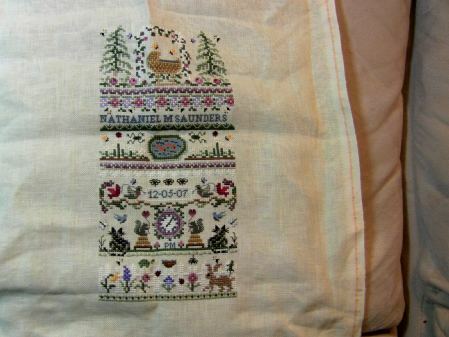 I am so excited…I have a finish:) On Friday, I finished Nathaniel’s birth sampler. My goal was to have it done by his first birthday and I more than made it. Now I need to start on a Christmas stocking for him. I also have to start working on another birth sampler as Nathaniel will be joined by a new cousin at the end of the year. My little sister is expecting her first child around Christmas. It is exciting that they will be almost exactly a year apart. It will also ease my missing the teeny baby days already. We are way past that stage already. Nathaniel is almost seven months old and almost 22 pounds. Today we took Nathaniel on his first trip to the zoo. We met my mom and sister and BIL there and had a great day. We saw tons of animals, but Nathaniel was most interested in the pigeons and the waterfall:) He had a great time. Congrats on your finish!! It’s beautiful! Yay! Beautiful finish Leslie! Congratulations! Well done! it is beautiful!! Lovely finish Leslie, well done. 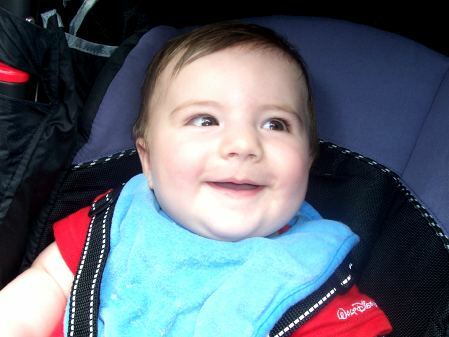 When my son was about 18months old we took him to the zoo for the first time. I’ll never forget his hearty chuckle when he looked up at a giraffe with it’s long neck. He’s 25 next week but that has stayed with me all this time. Great memories! Congratulations on such a beautiful finish! Nathaniel is just so cute!! Wow! That’s one heck of a birth sampler… and one heck of a little guy! Beautiful – do you mind telling me what pattern that is?